The TableFit High Chair by Graco brings your baby right to the table, so he can enjoy meals with your family from the start. The unique design allows the high chair to slide right to the table for a perfect fit. An infant body support and 3-position recline make early mealtimes comfortable for your little one, while the eight height positions help position baby at the table, to make feeding even easier. The tray removes easily with one hand and includes a removable dishwasher-safe insert for easy clean up, and a wipeable and machine-washable seat pad facilitate keeping your little one's dining space clean. Folds easily so baby's chair can be stored out of the way between family meals. 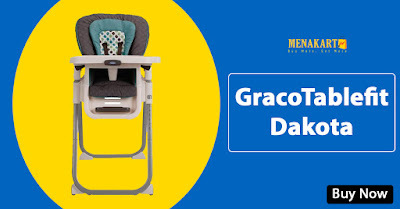 Convertible 3- & 5-point harness keeps baby safely secured during feeding as he grows so you can rest assured that the TableFit High Chair by Graco will easily seat your newborn to their toddler years! Will easily seat your newborn to their toddler years!